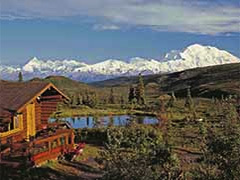 Camp Denali and nearby North Face Lodge are the only two backcountry lodges within the Denali National Park borders. Both locations enjoy magnificent panoramic views of Mt. McKinley. Many visitors never see “The Great One,” during their vacation but 9 out of 10 Camp Denali guests catch more than a glimpse of North America’s highest mountain from one of Alaska's most extraordinary lodging location. Living there makes all the difference! Camp Denali and North Face Lodge are located one mile apart in the center of the park - near Wonder Lake. 99-miles of mountainous, unpaved road isolate the lodges from the commercially developed park entrance. Nature shapes your experience here. 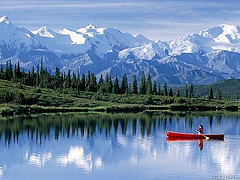 If you are looking for more than a brief introduction to Denali National Park, we aim to exceed your expectations. Hike the park’s backcountry, birdwatch, botanize, and observe wildlife with our naturalist-guides, who know Denali’s trail-less terrain and are students of its flora, fauna, geology, and cultural heritage. We can also help you plan independent adventures. For over fifty years, family stewardship has assured that Camp Denali or North Face Lodge remain small and individually and each lodge accommodates only 35 to 40 guests. We have limited electricity, few telephones, and no TV or bar. Creative handwork and attention to detail compliment a simple elegance that does not detract from the wild lands you come to explore. Your experience is personal - a unique blend of camaraderie among fellow adventurers and staff in a wilderness setting without parallel. In spite of our remote setting, we cultivate a high standard and commitment to good food. From our greenhouse we gather fresh lettuces, tomatoes, cucumbers, and herbs, as well as edible and decorative flowers. Each day our bakery produces delectable breads, cookies, pastries and desserts. From the tundra we gather and preserve wild berries for you to enjoy as jams and syrups. Individual arrival at Denali Village. Additional overnights may be reserved in advance. Our driver-naturalist guides meet you at the Park Rail Station at around 12:30 pm and the private lodge bus departs at 1:30 pm to connect with the Alaska Railroad service from Fairbanks. Denali National Park is renowned for its wildlife. During your 90-mile travel to the lodge you'll have fabulous opportunities to see most of the Park's wildlife up close. Bring your binoculars, lots of film and have your camera ready! 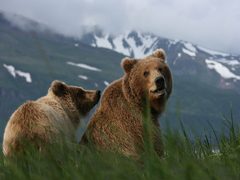 You and your driver will be on the lookout for Denali's grizzly bears, moose, caribou, dall sheep, wolves, fox, coyote, and numerous other smaller animals and assorted species of birds. A picnic dinner is served en route around 4:00 pm. A dessert reception is prepared for your arrival at 8:15 pm. Take advantage of the long daylight hours to stroll around the area or participate in the evening programs about Alaska and its wildlife. Guests can sign up to be alerted at night to get a glimpse of the aurora borealis.